Creating your marriage invitations can be a fun and memorable event. There are many ways to select the wordings for your invite, you are limited only by time and creativity. While the sky is the limit for what you can do with an invitation, it has to accomplish its main purpose, which is to clearly communicate to your guests that you are getting married and you would like for them to attend. It should also call them to action, so that they do submit their RSVP responses in a timely manner. Let's look at the some key parts of a wedding invitation. This line can be used to tell all your guests who is hosting the wedding. It commonly mentions the parents or the couple themselves. You can also use this line to say a nice sweet sentence to introduce the card. Using a poem in this line takes great skill, and can risk sounding very cheesy. This section serves to tell the wedding guests who are getting married. Tradtionally first and last name are usually used here for both people, but last names are not a requirement if the invitation is clear enogh. Above all, these names should stand out when seeing your marriage invitation card. The couple's name should be bigger than any other names on the invitation card, after all, it is their wedding. In the case where one of the couple is known more by their nick name than their real name, it's a good idea to include the nick name in parenthesis. This makes sure that the people who you are inviting at least know who you are. I have a friend whose nick name is Bobby. His nick name is so widely used, that some of his family isn't even aware of his real name. They even made a nick names to his nickname and call him bob. In his case, he should put Bobby or Bob on his invitation along with first and last name. This tells your guests what you are inviting them to. In this case it is your wedding or marriage ceremony. The wording here should be clear to avoid confusion in case there is a separate invitation for reception. It should clearly tell your guests what they will be attending. The order of the Host / Intro , Names, and Event sections can vary depending on who is hosting the event and the couple's preference. Ashley Bell and Brian Anderson Invite you to their wedding ceremony. Join us as we celebrate the joining of Ashley Bell, born to Michelle and John Cooperson to Brian Anderson, born to James Anderson and Mary Stephen in marriage. 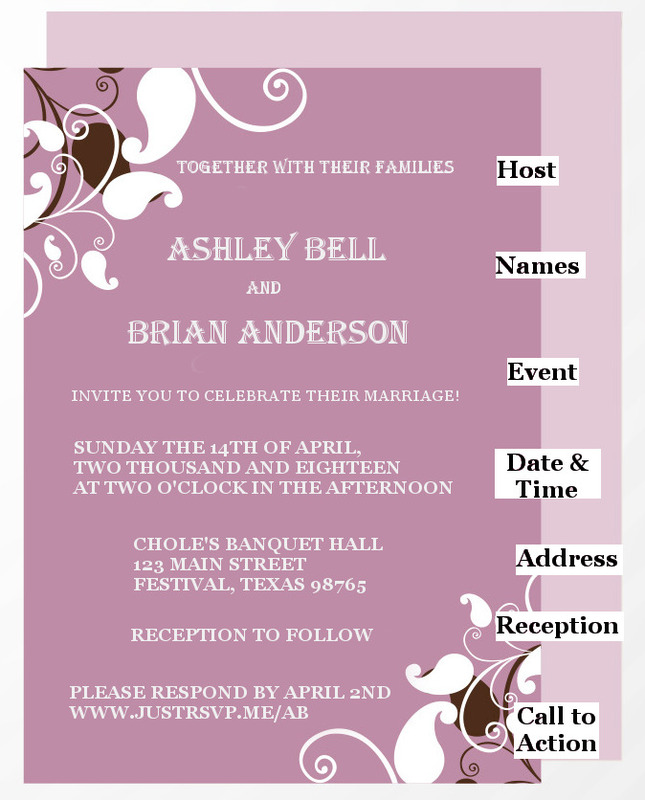 Love is in the air, you are invited to celebrate the marriage ceremony of Ashley Bell and Brian Anderson. The date and time is a matter of preference, It can be written out fully, abbreviated, or even done in old English. It should be legible and of course accurate. Test out the google maps directions yourself to see if your guests would have any difficulty arriving at your wedding venue. You can even go as far as driving to the venue following the directions from google. The last thing you want is for your guests to end up across the city all because of a little ambiguity. 07 13 2018 Wedding Hall, Bells TX. If all your wedding guests are invited to attend your reception then this is a great area to mention the reception. If you plan to have different invitations to better control who attends what event, then you can omit this from the wedding invitation all together. Join us for food and festivities after the ceremony. Share a meal and a dance with us at our reception following the service. Join us for a meal and an evening of fun following the ceremony. The celebration continues at our reception. Dinner and Dancing awaits you after the ceremony. Lets say you do not wish to have children attending the wedding and/or reception, there are different ways to word this. The message should be clear, but as gentle, kind, and as inoffensive as possible. Here are some samples. This information might be better suited on a separate invitation card if invitation and wedding ceremony are on different invitations. Please join us in celebrating at our adults only reception following the ceremony. Please honor our request for an adult only wedding and reception. Children my attend ceremony, but unfortunately not reception. Due to venue limitations, children may not be in attendance. Reception to follow, regrettably children may only attend the ceremony. Come celebrate with us at our adults only reception immediately follow the reception. We request that all wedding and reception guests be over the age of 16. Although we love children, we kindly request that all reception attendees be over 16 years of age. We kindly request that all reception guests be at least 16 years of age. Regrettably, children may not attend reception. This can be used to ask your guests to RSVP and return them to you. The best call to action lines ask the guests to do an action and then gives a time frame to complete the action. Giving your guest a respond by time helps with your planning, and lets guests know how soon to respond. The date can vary from a few days before the event, to even a few weeks before. It dependly largely on your limitations of food, venue capacity, and how your guests will responding to the invite whether it be by mail, email, online or phone. You also might want to secretly give a few day grace period because you are very likely to have late responses. There are different ways to collect rsvp responses, they include mail, online, email, by phone. Each method has it's advantages and disadvantages. If you haven't considered paperless invitations there are many benefits to paperless invitations that can work out nicely for yourself and your guests. With these invitation wordings you can mix and match them to make it as formal or informal as you like so that you can communicate your exact message to your guests for that special day. We hope that this guide and the marriage invite wordings have been helpful to you.